Now that it is clear President Obama will be running for reelection against Mitt Romney, Panderbear decided it was time to directly compare the details of their statement truth ratings. Panderbear created the chart from statement ratings by PolitiFact.org. Those who have been reading Liar! Liar! regularly know that while President Obama's Truth Quotient (TQ) is solidly in truth-telling territory, Mitt Romney's is comparable to those of pandering Congressional leaders, which is to say not so good. But what about the actual percentages of statement ratings in each of PolitiFact.org's categories: True, Mostly True, Half True, Mostly False, False, and Pants on Fire? These are revealed in Panderbear's chart. 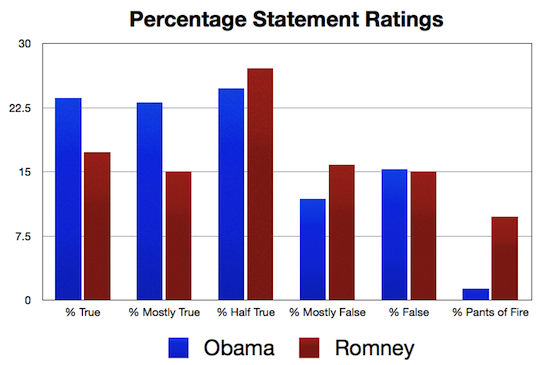 It is clear that President Obama easily bests Romney in the percentage of true and mostly true statements. It is even more clear that Romney has a special talent for making pants on fire statements. His rate of outrageously over the top false statements is 7 to 8 times that of the president. In the other categories the differences may not be statistically significant except possibly Romney's higher percentage of mostly false statements. Most voters don't seem to care much whether politicians are telling the truth as long as they are saying what they want to hear. Truth-telling does matter to Panderbear and hopes that it does to you as well. Thanks for this information! It's maddening how the Republicans wrap themselves in the flag, mom, and apple pie--"family values" and all that jazz--yet lie through their teeth. You'd think that telling the truth would be a foundational value of decency. Fox Headline: Romney "True" ~60%, but Obama "half true" or "false" ~55%.. Sad, but true. That's why the news consumer should always adhere to the maxim Caveat Emptor. I was directed to this site to see a comparison between Obama and Romney. I see your chart but do you have the examples of the statements made that are questionable? I question your stats on Obama as I felt he has not been truthful from the beginning when he said that he administration was going to be the most transparent and that ALL bills would be posted on the internet for 5 days before being voted on. The statement ratings all come from PolitiFact.com. Every statement rating provides sources and a rationale for the rating. You can judge for yourself whether their ratings are reasonable or off the mark. I agree greater transparency would be better. As for posting bills on the internet for 5 days before being voted on, that is up to Congress, not the president. What do you think of selection bias? It appears from the graph that the odds of Romney making a statement that is either "true" or "mostly true" is roughly 33%, or one in three. Probably not coincidentally, those are the same odds you get by playing the shell game of "guess where the pea is hidden". Considering Obama Care is a tax, this administration is not transparent, Obama claims he visited 57 states, either lies about or can't remember his own birthday and refuses to provide non-altered documentation as proof of his citizenship I would have to say I will trust Romney first. Obama killed the Trans-Canada pipeline to get votes in November even though everyone in Congress on both sides said we needed it just like none of them would accept his budget. Trusting Obama will get you screwed but with Romney there is a chance however small that you will be okay. Do you really believe President Obama doesn't know how many states there are? The 'birther' issue was resolved conclusively by the state of Hawaii ages ago. It's a non-issue. Obama did not kill the Trans-Canada pipeline. He okayed part of it and required additional environment impact study of the rest. Your statement regarding "both sides said we needed it..." is just plain false. More generally Panderbear does not decide issues and who to vote for on the basis of trust, but based on fact-based logical reasoning and best science. Those are currently on the side of President Obama. Truth matters and it is critical with the presidential role.